The healthcare industry is going through a mobility transformation as healthcare providers transition from the legacy, point and horizontal communications technologies that are out-of-step with the challenges faced by providers. Simply put, these technologies do not support the clinical workflows necessary for the providers to deliver better outcomes for the patients and derive better operational results for their organization. As a result, providers continue to lose billions of dollars due to communications errors and inefficiencies or incur bad patient outcomes due to poor or inaccurate communication. Care team productivity also lags because of the inability of the providers to utilize technologies and solutions to support the care team and patients wherever they are. AGNITY Mobilecare is a cloud-based clinical communication and collaboration (CC&C) platform that meets the challenges faced by providers. It seamlessly blends unified communications and Health IT technologies into a simple and easy to use mobile and web client that supports clinical workflows which drive better patient outcomes and higher ROIs. Clinical workflows such as HIPAA compliant secure text, voice, image and video messaging to anyone; patient data access; alarms and notification from any telemetry system; medication administration; and post-discharge follow-ups are a few examples of the workflows enabled by AGNITY MobileCare. Furthermore, AGNITY MobileCare Workflow Wizard™ provides business analysis tools to allow the providers to customize clinical communication and coordination workflows down to the department level. 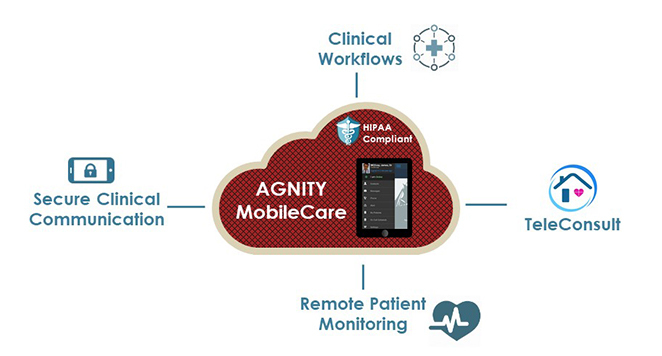 AGNITY MobileCare provides instant and secure communications (text, voice, video) and collaboration to mobile and web devices utilized by the hospital staff and affiliates; independent of communications and IT infrastructure. Nurses, physicians, and staff can have immediate access to data and quickly locate and securely communicate with anyone in the patient’s circle of care. Support staff can also have a communications tool, without access to protected data, to more effectively communicate inside and outside the facility. The power of this includes substantial cost savings, higher productivity, and better patient outcomes. Utilizing our MobileCare platform enables AGNITY to equip solution providers with advantages unequaled in the industry. First, providers will be unleashed from the limitations and inefficiencies of the legacy communications systems and devices they are currently using, without the huge financial and operational burden common with “rip and replace” practices associated with updating their existing communications infrastructure. The MobileCare platform will enable AGNITY to deliver its clinical communication and collaboration solution with whatever infrastructure is already in place. Second, providers will be freed from the limitations of legacy and system specifics devices and enabled to utilize the power of mobile computing provided by smart technology. A Point of Care (PoC) device in which all communications, alerts and alarms, patient data access and another point of care applications can operate is enabled with the MobileCare platform. One device will finally be a reality through the AGNITY Mobilecare solution powered by the AGNITY MobileCare platform. The AGNITY MobileCare platform enables anytime, anywhere communications via the AGNITY MobileCare mobile and web clients by integrating with an existing PBX or communications system as well as EMRs and other Health IT systems. This is executed via open APIs and a variety of communications and health IT protocols and interfaces. 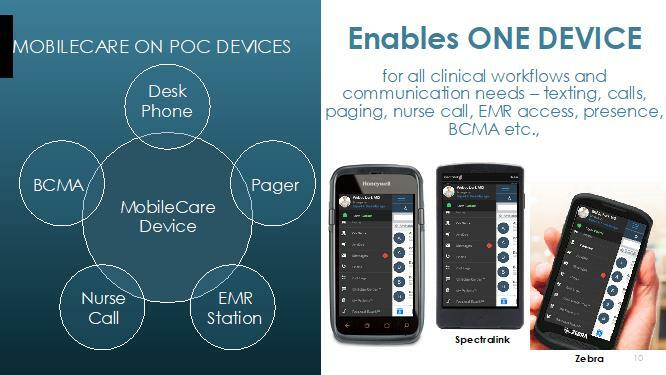 The AGNITY MobileCare platform also enables the AGNITY MobileCare client to operate and bring unified communications features to healthcare grade POC devices from leading devices providers and partners including Zebra Technologies, Honeywell, Spectralink, and others commonly used. It also enables AGNITY MobileCare to run on any iOS or Android-based smart devices so providers can take advantage of “Bring Your Own Device” in their workforce. The combination of BYOD and facility provided device options ensure maximum coverage, adoption, utilization and productivity of the care team, and ultimately better patient outcomes. MobileCare is supported on all iOS devices (iPhone 5, 6 and 7, iPad, and iPad mini), and a wide variety of Android smartphones and tablets. In addition to the mobile devices, the MobileCare application can also be delivered as a WebRTC application on PCs and laptops.